Liberalisation ahead – will it change the game? In May the Spanish government published a law (Ley 13/2011) that will transform and liberalise most sectors of the Spanish online gambling market from beginning of 2012. Therefore Spain is currently on the top of the strategic agenda of most industry executives. While other jurisdictions (e.g., Germany) are still figuring out the details of their likely liberalisation, Spain is ready to start right now. In previous years, announcements of a coming market liberalisation were always met with great enthusiasm, but now - at least since the partly negative experiences in France - things are more complex, and more questions emerge: What are the tax rates? What other regulations will be imposed (e.g., authentication, IT systems, ...)? What is the size of the market? How much will it still grow, or is it perhaps already saturated? The increased complexity of the market has also led to increased demands on market research and analyses - simple and short answers just do not work. Therefore, MECN spent several months compiling the most comprehensive and detailed report (ca. 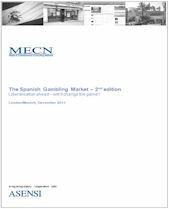 120 pages) on the Spanish gambling market. Analyses of all sectors - The report analyses all sectors of the gambling market: focus on interactive/online gambling, betting, lottery, bingo, casinos, and gambling machines. Liberalisation process - Up-to-date information about the ongoing liberalisation, including detailed explanations of regulations (e.g., taxes, ...) - produced in cooperation with the leading legal experts of Asensi Abogados. Current market figures - Comprehensive market data up to 2010, such as market size and development of sales/turnover as well as gross revenues. Forecasts to 2015 - Detailed forecasts (2011 to 2015) for all sectors with a special focus on the interactive/online market. Unique insights through a survey of market insiders - Many analyses are based on the results and unique insights we gathered from our survey of Spanish market insiders and operators. In total, the report has ca 120 pages and 81 graphs/exhibits.